Skechers Interflux 98131L is a boys casual trainer. It features a smooth knit mesh fabric upper with a padded collar and tongue for added comfort. Elasticated laces at the front of the shoe allow for easy on and off, while the single Velcro strap allows for adjustability and a secure fit. The Skechers Air Cooled Memory Foam insole helps to cushion every step, making it a great all day wear. 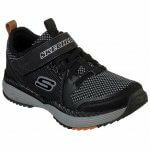 Jump into fun with Skechers Interflux 98131L.